All of our breads are authentic and contain no artificial flavorings, trans fats, or high fructose corn syrup. We pride ourselves on being local and fresh. Alpicella Baking, based in Boise, Idaho, produces local, fresh, authentic sourdough and premium variety breads for restaurants, institutions, and the major grocery trade. We invite you to view our product menu then contact us for more information or to answer any questions. In 1996 Alpicella Bakery was started to meet the demand for a full-service, wholesale French and sourdough bread producer. The sourdough and French market was nonexistent at that time, so Alpicella was born in a 7000-square-foot building in downtown Boise. 10 years later we had outgrown our bakery so we moved into a 50,000-square-foot building on the outskirts of Boise, just off of Broadway Avenue. We are still here today baking our products fresh for you daily. 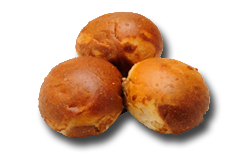 To try our bread, visit your favorite grocery store or enjoy it in one of over 400 restaurants that carry our bread. We are a local company doing business with local companies. Our ingredients are supplied by local purveyors, earning us the Idaho Preferred status.